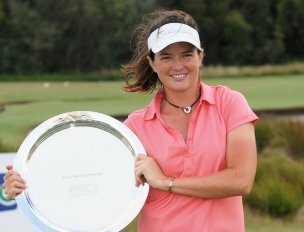 Frenchwoman Joanna Klatton won the Victorian Open on the second playoff hole today, after a presumptuous clubhouse beer. The Victorian Open featured both the men’s and women’s tournament played consecutively across the weekend and there were some stunning finishes. The Women’s Victorian Open was one of the best finishes you’ll see in golf. Joanna Klatton started the day five shots behind leader Rebecca Flood but managed to overhaul the deficit and sat in the clubhouse two shots clear of the field. The 26-year-old Frenchwoman was offered a celebratory drink soon after finishing her final round but soon realised she was part of a playoff to decide the winner when Korean Haeji Kang holed a 100 metre shot on the final hole for eagle. “They handed a beer to me and supposed it was over, but I did tell them it was not over, she could hole the shot,” Klatten said. Klatton managed a long par saving on the first playoff hole, eventually outlasting Kang and winning the tournament. Scott Arnold of New South Wales won the men’s Victorian Open by outlasting a fast finishing Kurt Barnes. Arnold hit a stunning bunker shot on the final hole to save par to beat Kurt Barnes by a shot. Barnes, chasing Arnold all day looked as though his day was over after bogeys on 13 and 14 but a birdie on 15 and an eagle on 17 left Barnes with a shot at forcing a playoff on the final hole. The birdie putt missed, handing Arnold his first professional victory. With two fantastic finishes all played out on the same course and within an hour of each other, there is no doubt the Victorian Open was a huge success, and a format that may well be emulated around the world. Congratulations to Klatton on her victory. Yes in professional golf the tournament is never over until the last ball is holed. Fortunately for her she was able to regain her golf swing and composure and complete the victory. I think she’ll do things differently next time.